हजरत उसमान रजिअल्लाहो अन्हु जो मुहम्मद सल्लल्लाहो अलैहि वसल्लम के दामाद थे उनकी भी दर्दनाक शहादत कुरआन पढ़ते में हुई। एक और मुख्य बात हजरत अली रजिअल्लाहो अन्हु, जो हजरत हुसैन रजिअल्लाहो अन्हु के पिता और मुहम्मद सल्लल्लाहो अलैहि वसल्लम के दामाद थे, की भी दर्दनाक शहादत हुई। अब गौ़र तलब बात है कि इनके बेटे हजरत हुसैन रजिअल्लाहो अन्हु ने शहादत क्यों नहीं मनाई तो फिर हजरत हुसैन रजिअल्लाहो अन्हु की शहादत क्यों मनाई जाती है?
" 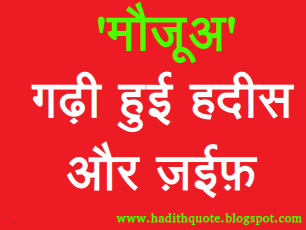 Maine Maisara Se Pucha Ap Ye Hadith Kaha Se Late Hai Ki Agar Fala'n Fala'n Chez Padhe To Uske Liye Yah Sawab Hai Etc. To Usne Jawab Dia Ki Ye Bate Mere Apni Gadhi Hui Hoti Me Is Tarah Logo Ko Bhalai Aur Neki Ki Tarf Bulata Hu"
Aap Rasul s.a.w Ne Farmaya Muqabla Sirf Nezabazi ,Oont Daud , Ghore Ki Daud , Aur Pairdo(kabutar etc) Me Hi Jaiz Hai"
Toh Shariat Me Is Amal Ki Ijazat Nahi Hai. Logo Ko Duao Ke Baad Apne Jism Par Bhi Hath Nahi Ferna Chaiye Na Hi Apne Ankho Ko Chumna Chaiye. Ulemao Ne Ye Bayan Kiya Hai Ki Anguthe Ko Chum Kar Apne Aankho Par Rakhna Ek Biddat Hai Jo Ki Sufio Ke Tareeke Se Ijaad Hua Hai Aur Jo Iske Bareme Hadiths Hai Wo Rasoolallah Par Jhutha Mansub Kiya Gaya Hai. Allah Hum Sabko Biddaton Se Mehfuz Rakhe , Quran Aur Sahih Hadees Per Amal Kerne Ki Neik Tawfeq De ,Hidayat E Ilm & Hidayat E Amal Ata Farmaye Aur Humari Ibadat Ko Qabul Farmaye .Aameen ! WHICH SECT (FIR'QA) WILL ENTER INTO JANNAH? & WHAT YOU CALL YOURSELF? This verse refers the whole believers, the Muslims, as one community and the best one who invite towards good and forbid evil; and one who would set an example of Unity, Integrity, Brotherhood, Truthfulness and Trustfulness to the rest of the communities. Because of these dominating features, the Muslims were called “Khayra ‘Ummati” i.e. The Ummah (Community) who performs good. But regrettably, instead of being the model of Integrity and One Brotherhood, today Muslim ummah has created divisions among themselves and thus in the sacred religion of Islam too. Instead of being called as Muslim, they feel proud to be named as a people of particular sect or division. This mindset of Muslim Ummah has provided the Dis-believers with an amplified opportunity to take over us and harm the basis of religion of Islam. Once the biggest empire has now divided in the name of sects and are fighting among themselves. And the Non-Muslims are never hesitant to take the full advantage of it. Intervention of Western Alliances in Shia- Sunni based disturbed regions like Iraq, Afghanistan, Syria, Egypt, etc and political advantages driven by politicians in the name of sects in India, Pakistan, Bangladesh, Myanmar, etc are among the few examples of this. What is the Mystery of these sects in Islam? What is the Mystery behind the Creation of Sects in Islam. Only one sect will enter into Jannah and rest of them not? Note: There are group of people believes that only one sect will enter into Jannah and rest of them will abode into hell fire forever. Go through the above note for the detail answer on this issue. For a long time, there exist many Islamic Groups having their purpose of maintaining the sanctity and essence of Islam among Muslims and undertaking the work of da’waah to spread Islam among Non-Muslims. Normally they all have common belief in Allah that he is the only Creator and Sustainer of the world,in all his prophets including the Prophet Mohammed (pbuh) (his Final Messenger), in the day of Judgement, and in Qur’an &Sahih Hadith. But the Irony of the current situation is that, now these Groups have slowly shifted from calling themselves as Islamic Groupto “A SECT”. The questions raises now, why do they call themselves a sect rather than merely an Islamic group, which worksfor the cause of Allah? 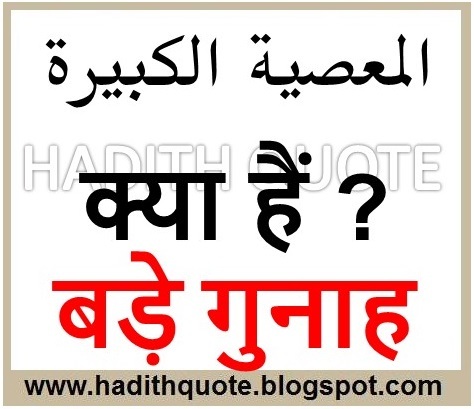 Answer to this Question too lays in the above quoted Sahih Hadiths. We have many Islamic Groups like, Tableegh, Salafees, Ahle Hadith, Ahl al-Sunnahwa’l-Jamaa’ah, Jamat-tul-Muslimeen, etc… many. I had a Talk with many Scholars of TableegeJammat, this Jammat has many negative points and very few positive point. This Jammat also known as “Bidha(Innovators In Islam)Jammat” in many countries of the World. Many people from this Jammat openly call that they are the only Group/ Sect/ people who will enter into Jannah; and those who joins them will get the same as they do. This group basically has the long tradition following “Sufism”, they normally believe in Intercession of righteous dead to fulfill their wishes. ARE THE SUFI SHAYKHS REALLY IN CONTACT WITH ALLAAH? Dr Zakir Naik on Sects in Islam. This is another group among the Ummah, which, they claim, are the followers of Salaf-us-SaalihSahaabah.The word Salaf is a shortened version of the word ‘Salaf as-Saalih’, which means the ‘Righteous Predecessors’.Taabi’een and all first three generations. All the Great Scholars use this term to distinct themselves from Bidha group when required, they call themselves as “Salafi”. But when analyse we find, this practice remains fruitful as intended by Sheikh Albani for the time being only, when there was only one Jammat or group called “Salafi”. but today we have many Sect within the “Salafiees” eg. Mathkhali, Suroori and Qutubee. Each Salafi sect calls Kafir to another “Salafi” Group. If sheikh Albani said “its compulsory to call yourself as Salafies”, We should demand production of a proof in the light of Qur’an and Sahi Hadith whether the Qur’an and Sahi Hadith commanded us to call ourselves like this? then taqleed of Sheikh Albani or any other scholar except that of Qur’an and Sahi Hadith is not allowed. Islam permits the taqleed of only Qur’an and Sahi Hadith”. This is another group among the Ummah, which, they claim, are the followers of“ Qur’an and Hadith” i.e. “words of Allah and words of prophet” .Since, the hadith can be Sahih and Daeef, the better word to use for “Me” is “Ahle Sahi Hadith” as I follow only Sahi Hadith excluding the Daeef ones. The imams, in the past and more recently, have said a great deal describing this group. There is no much difference between Salafi and Ahle hadith groups as the essence of both are same and the conditions too. Like Salafiees, in Ahle Hadith too we find many sects (like Jam'iyyah Ahle Hadees, GurbaAhle Hadith, etc.) calling another Ahle Hadith groups, Mujahidin(KNM). In some country they call themselves “Ansari”. All belongs to same group but Name is different. Note : Recently, during a discussion, I came to know that according to them, Following Qur’an and Sahi Hadith Will not sufficient a person to not enter into Jannah but He/ She Has to be a Ahle Hadith also. For more detail Go through the below links. NOTE: We don’t have any intention to Harm or Hurt any Group or sect, we respect all great scholars and even We use their work in our talks and presentation Allhamdulilah but Taqleed is not allowed, Taqleed of, only Qur’an and Sahi Hadith allowed. I have to agree that, the groups or Islamic Jammat which is close to the Qur’an and Sunnah is “Ahle Hadith and Salafi” but the recent discussion give me a different angle to my whole perception because of their shifting of Ideals or believe. ISLAM PROHIBITED CREATING SECTS IN ISLAM. Some may argue for the sect by quoting the above mentioned hadith of our beloved Prophet which says of fragmentation of Muslim ummah into seventy-three sects. But we neglect the essence of these hadith while quoting them which reports the prophet’s prediction of the emergence of seventy-three sects. He never said that Muslims should be active in dividing themselves into sects. The Glorious Qur’an commands us not to create sects. Those who follow the teachings of the Qur’an and Sahih Hadith, and do not create sects are the people who are on the true path. and says only one sect (one united group or sect) will enter into jannah and a person who practice Islam in his individual capacity without relating him to any Sect or Group will be denied the same even though he is adhered to the teachings of Qur’an and Sahi Hadith. Does the Education Minister specify any Name of School the student where of will pass the Exam?No! He means to say that a student, no matter from which part of the country or which school he belongs, who studies well and work hard toward his goal, In shaa Allah, he will pass the exams. Here, students from different areas and schools etc...Who pass the exams can be referred as one Group or Sect. 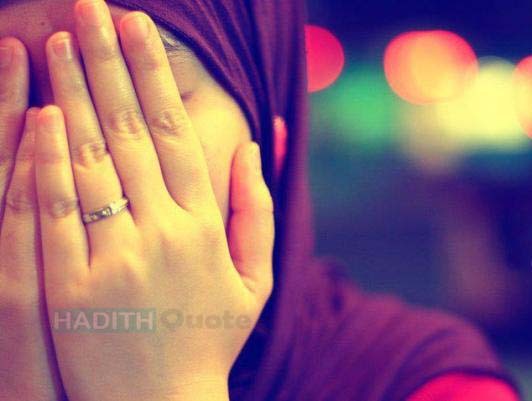 And while mentioning the kind of people will be achieved felicity, the home of Allah, the Jannah : said only one. Did Prophet Mohammed (pbuh) Specify any Name of group other than Muslim? Whether He said only a people having its association with a group (together with the other persons of the group) will be rewarded with jannah? The answer remains same - No! When prophet says only one sect will enter into Jannah, he means to say that a Muslim who is strictly adhering to the teachings of Qur’an and Sunnah (Sahih Hadith), irrespective of his/her nationality, association with an Islamic Group,Colour, Caste and occupation will enter into Jannah. Allah clearly has given the criteria for the salvation. Indeed working in a Jammat in the way of Allah, spreading the Islam is fard, it will not be get effected by shayaten , blessing of Allah upon them and give better results in spreading Islam. This verse particularly referring to a “Dawees” who dedicated themselves in the way of Allah. It’s very important part of Islam, spreading the Message of Allah to the world and it’s also important for us to join any Jammat or orgnisation which strictly adheres to the Qur’an and Sunnah so that we could not go astray and could adhere to Islam with all its essence. But when a group or sect or Jammat starts claiming that they only will enter into Jannah, its Haraam in Islam. The Qur’an and Sahi Hadith no-where says that Ahle Hadith, or AhleSunna-tul-Jammat ,or Tableege or Salafees or any particular Group or Jammat only will enter into Jannah. Saying and claiming like this absolutely prohibited and against the teaching of Qur’an and Sahi Hadith. AllahSubanawatala, our Prophet and Islam prohibits creating sects. But at the same time Allah Subanawatala knew that still we, Muslims, will create sects and there will be sects in ummah; and Prophet Mohammed (pbuh) also predicted the same that there will be sects in Ummah and only the people who follow the Qur’an and Sahi will be victorious and they are the true believers of Qur’an and Sahi Hadith. Qur’an and Sahi Hadith is the criteria to judge for what is right and what is wrong. Anyone whatsoever claims verify it with the Qur’an and Sahi Hadith and judge it whether what they do is as per Islam or not. We do agree that there are many organizations closest to Islam than others, but association with these organizations or Jammats shall not be the criteria to judge a person instead a person shall be judged in his individual capacity on the basis of his association with the Qur’an and Sahih Hadith; this is also the Thumb rule that Islam prescribes. We, Muslims, have divided our community and created many sects - Division on the basis of The Four Imams. Shafi :later there are many division created within. If you come with any New Name of Jammat or sect, there will be a division later within. WHICH GROUP WILL ENTER INTO JANNAH? “Those who follow the Qur’an and Sahi Hadith Will enter into Jannah, all of them referred as one group” They are only Muslims only and nothing else. The Prophet (peace and blessings of Allaah be upon him) told us that his ummah would follow the previous nations, the Jews, Christians and Persians, but this was undoubtedly not praise for their actions, rather it is by way of condemnation and a warning. In any event, if there is any division between a Muslim and a Christian on the grounds of dogma, belief, ethics or morality, then the cause of such conflict could be traced to an utterance of Paul found in his books of Corinthians, Phillipians, Galatians, Thessalonians, etc., in the Bible. Following the Qur’an and Sahi Hadith, still not sufficient for you enter into jannah but you have to join our group, sect, Or FIR’Q for the salvation. WHAT YOU CALL YOURSELF? OR WHAT SHOULD WE CALL OURSELVES? What should we call ourselves? Those who are the follower of Qur’an and Sahi Hadith, this is the bitterest and hardest reality for choosing other Name rather than what our creator commanded to call ourselves. When one asks a Person who believes in Allah and his final Messenger, "who are you? ", the common answer is either ‘I am a Sunni, or ‘I am a Shia’. Some call themselves Hanafi, or Shafi or Maliki or Humbali. Some say ‘I am a Deobandi’, while some others say ‘I am a Barelvi’, or ‘Tableeg‘ or ‘ Ahle Hadith’ or ‘ Salafi’ or ‘Ahle sunnatul jammat’ etc…. But What . . . . .
Allah says in the Qur’an? On the contrary Allah says those who strive in my way, do the righteous deeds, call yourself Muslims only but We prefer to choose other names over Muslims and we feel too shy to call ourselves Muslim, follower of Qur’an and Sunnah. At least 37 time the word “Muslimoon or “Muslimeen” (both together) occurs in the Qur’an. This Name is chosen by our Creator, Sustainer, of the Whole Universe but we choose many others Name besides, to call ourselves by giving thousand of useless excuses. When anyone ask, ‘Why do you call yourself with another name beside “Muslims”, they reply “we call ourselves in order to distinct from deviated sect” How justifiable this statement is? “Were there no other deviated sect during the time of Sahabas? Off course there were, Khawarij, munafiq, etc.. Did Sahabas choose any other name besides “Muslims”? No. whether they created any sect by different names? Again the answer is “NO”. Then why shall we call ourselves by any other name beside “MUSLIM”. We don’t have any problem if someone following any Imam or working in any Islamic Jammat, as long as He or she follows the Qur’an and Sahi Hadith. If “Ahle Hadith, Salafies, Sunna tul Jammat, Tableeg etc.. by the meaning its means follower of Qur’an and Sahi Hadith then we all are that but “We should not use these Names as creating sects or calming the only sect or group or Jammat will enter into Jannah. The conclusion: What shall we call ourselves? We shall be referred as “Muslim” only. What was the prophet Mohammed (pbuh) ?Hanafi, Shafi, Malaki, etc..Deobandi, Baralvi, Tableeg, Ahle Hadith, Salafee? What was HE? “Muslim” only. Allah says in the Qur’an Jesus (pbuh) was Muslim. Allah says in the Qur’an, Ibrahim(pbuh) was Muslim. Transliteration: Mā Kāna 'Ibrāhīmu Yahūdīyāan Wa Lā Naşrānīyāan Wa Lakin Kāna Ĥanīfāan MUSLIMĀAN Wa Mā Kāna Mina Al-Mushrikīna. What we learn for these, those who believe in Allah and Mohammed (pbuh) are MUSLIM only and we should call ourselves MUSLIMS ONLY. FIRST MUSLIM, AND LAST MUSLIM, FOLLOWERS OF QUR’AN AND SUNNAH. Sajda sahu se wo 2 sajde murad hain jo namazi namaz mein bhool ki wajah se salam se pehle ya baad mein karta hai. Sajda Sahu ka tareeqa ye hai ke aaqhri qaede mein tassha‐hud (darood) aur dua padhne ke baad Allahukabar keh kar sajde mein jaei’n. Phir uth kar jalse mein baith kar doosra sajda karei’n aur phir uth kar salam pher kar namaz se farigh hu’n. In HAdiths se hame ye malum hua ki Jo shaqs 4 rakat ki jagah 3 padh kar salam pherde phir jab isko malum hojae ke main ne 3 rakat padhi hain to khuwah wo ghar bhi chala jaae aur batei’n bhi karle to phir bhi wo 1 rakat jo reh gai thee padhega isko saari namaz padhne ki zarurat nahi. Sajda Sahu salam se qabl ya baad karne ka zikar to ahadees mein aap mulaheza farma chuke hain. Lekin sirf 1 hi taraf salam pher kar sajde karna aur phir Attahiyyat padh kar salam pherna sunnat se saabit nahi hai, kyou’nke Tirmizee (395) ki riwayat ko Allama Naasir Uddin al Albani ne shaaz (T: Something deviating widely from common rules) kaha. This Article contains brief description of Prophetic (ﷺ) Salah( Prayer-Namaz ). Since we know that Salah(Prayer) is one of the Major Pillar of Islam. So, it must be prayed according to the guidelines of Quran and Sunnah. A Pray as Prophet(ﷺ) had prayed. B Importance of Salah(Prayer) in Islam. F Joining shoulders to Shoulders and foot to foot. G Eye Should point to the Spot of Prostration. I Where to place Hand during Salah(Namaaz). K Is it Permissible to recite Surah-Fatiha behind Imam? L Is it permissible to say ‘Ameen’ Loudly? M Rafayadain(Raising Hands in Salah). O Qawmah (Standing after Ruku). P Going to & Getting up from Sajdah/Sujood (Prostration). R Jalsah (Sitting between two Sajdah). महापाप (बड़े गुनाह) क्या हैं ?